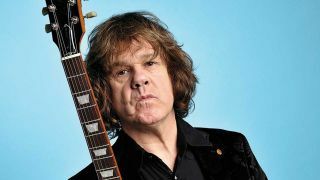 In October, an album paying tribute to the late, great Gary Moore was released. In a field where tribute albums are often hastily assembled affairs stuffed with songs recorded in fleeting moments of downtime, Moore Blues For Gary - curated by Moore's longtime bass player Bob Daisley - stands out not just for its stellar cast, but for the quality of the recordings. Joining Daisley on the album are Steve Lukather, Danny Bowes, Glenn Hughes, Joe Lynn Turner, Steve Morse, John Sykes, Neil Carter, Doug Aldrich, Eric Singer and many more. “I asked many members of the Gary Moore family tree, and some other great players, to contribute to the project," says Daisley. "The response was not only encouraging, but very moving. It seems that the name Gary Moore is also synonymous with the words ‘respect’, ‘honour’ and ‘greatness’." Moore Blues For Gary is out now. Below, Bob Daisley talks about the album. Can you tell me a little bit about why you put this album together? It was very sad for me when Gary died in 2011. There were quite a lot of mentions in the press, and people said nice things, but by about 2013 I started to wonder if enough was said and done. After all, he was such a great player. A great musician, a virtuoso, and one of the all-time greats. I wanted to do something really nice for Gary, and put together something that was very credible – with well-respected musicians – and by about 2014 I'd begun to phone around various people and ask if they'd be interested in doing a track. The response was so encouraging, I thought, 'I have to do this!' And the ball got rolling and beginning of 2015. Do you think he's under-appreciated as a musician? I think he's probably always been a bit underrated. Having worked with him myself I saw firsthand how good he was. And he was. He was really brilliant. I remember touring America with Gary in the late 80s and Gary Moore wasn't that big there, and other people who Gary had influenced were actually bigger than he was. Doing the blues thing put him on the map internationally, which is why I chose the blues catalog to pick the songs for this album. I really do think he should have been a bigger name than he was. What do you think it was that held him back in that respect? I really don't know. There were certain areas, like in England or in parts of Europe where he was huge. But in other areas in the world he just wasn't as accepted and acknowledged as being the great that he was. The real reason for that is anybody's guess. What are your favourite Gary Moore songs? One of my favourite songs – especially from the blues catalogue – is Story Of The Blues, which is a good song. Another favourite is Nothing's The Same Without You. Just after my mom died that song really touched a nerve. What do you think you'd be doing now if he was still with us? Gary experimented a lot over the years with various genres of music. I imagine that he'd still be doing blues-orientated stuff or blues-influenced stuff, or maybe just pure blues stuff. But who knows? How did you go about approaching people for the album? Just a phone calls and emails, and I got the same response from everyone: yes, I'ld love to. Musicians like Steve Morse, Joe Lynn Turner and Steve Lukather said yes immediately. Another person that said yes was Jack Bruce, which I was over the moon about, because Jack had worked with Gary and they were mates. Jack was going to sing a track because I was playing bass on all of them, and then several months later he died. So that was doubly sad for me, to lose such a great musician as Jack Bruce. Do you think it was daunting at all for other guitarists to come in and play those parts? I should imagine it would be certainly a challenge for some. There's only ever one Gary Moore. But I think everyone's done an admirable job. What do you think Gary Moore fans will get from this album? Well, so far I couldn't ask for better reviews. They've been brilliant. The comments on social media have also been very good and really supportive, and there's a lot of love out there for Gary Moore. I think that all the people that love Gary and his music are appreciative of this having been done, because it's yet more recognition of his greatness. And if it opens up doors for people who have never heard Gary before that, that would be a benefit.